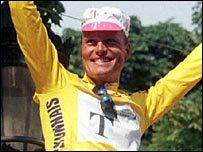 Cycling's governing body has called on 1996 Tour de France champion Bjarne Riis to return his yellow jersey after the Dane confessed to doping. Riis became the first Tour winner to admit doping when he said he had taken illegal blood-booster EPO between 1993 and 1998. "I purchased it myself. It was part of everyday life as a rider," he said. The International Cycling Union (UCI) urged Riis "to return his yellow jersey, the symbol of his victory". Cycling has long been hit by doping allegations but in the past week a number of the sport's stars have admitted doping. Riis's admission came the day after former Telekom team-mates Erik Zabel and Rolf Aldag also admitted using EPO, while 2006 Giro d'Italia winner Ivan Basso is facing a 21-month ban after admitting attempted doping. UCI president Pat McQuaid says he believes cycling has reached a turning point. "Although the past and the present may confront us with difficult issues, there is now a strong desire among the majority of people in the cycling world to change things," he said in the statement. "Cycling is currently in a crucial period of self-criticism, a necessary step if we are to move on to a healthier situation. "The process underway must lead us to a new kind of cycling, with a new spirit among the riders, managers, sporting directors and team doctors who have learned from the all-too-often negative experiences of the past. "I am very optimistic and urge all those involved in our sport to co-operate. "The UCI urges all other riders who have doped and any other people who have encouraged them, anywhere in the world, to speak out too."